ACROSS THE Horn of Africa evidence is mounting that relations with Gulf countries are growing stronger. Last month representatives from Djibouti, Sudan and Somalia gathered in Riyadh, the capital of Saudi Arabia, to discuss the creation of a new Red Sea security alliance. Three months earlier the prime ministers of Ethiopia and Eritrea signed a peace deal that Saudi Arabia helped to broker. In the Ethiopian capital, Addis Ababa, a property developer from the United Arab Emirates (UAE) is working on the largest and most expensive project of its kind in the city's history. The UAE has had a military base in Eritrea since 2015 and is building another in Somaliland, a breakaway state in northern Somalia. Saudi Arabia plans to build one in Djibouti. And Qatar and Turkey are refurbishing a port in Sudan. Why? Like the Gulf, the Horn of Africa is predominantly Muslim, and the regions are also bound together by migration. Economic links were relatively dormant throughout the 1990s. But after food prices spiked in 2008, wealthy Gulf states rushed to buy farmland in Sudan and Ethiopia as a hedge against food insecurity. Between 2000 and 2017 Gulf states invested $13bn in the Horn of Africa, mainly in Sudan and Ethiopia, according to a study by the Clingendael Institute, a think-tank in the Netherlands. For resource-poor Horn countries the economic benefits of Gulf investments are obvious. Both Sudan and Ethiopia suffer from severe shortages of hard currency. One of the first moves of Abiy Ahmed, Ethiopia's prime minister, upon taking office in April was to secure $3bn in aid and investments from the UAE, including a $1bn deposit in the country's central bank. Sudan's central bank received a deposit of $1.4bn from the UAE in March. In Gulf states, where capital is rarely genuinely private, business tends to serve foreign-policy goals. For Saudi Arabia, renewed interest in the Horn has been primarily driven by competition with Iran. In 2014 it forced both Sudan and Eritrea to cut ties with Iran and eject Iranian diplomats. For the UAE—a logistics and transhipment powerhouse—the growing threat of Somali piracy in the 2000s, followed by the outbreak of war in Yemen in 2015, prompted a new focus on maritime security. Its string of ports and bases along the southern rim of the Arabian peninsula and up the Red Sea is part of a strategy to project influence throughout the region (it uses its base in Eritrea to launch attacks in Yemen). A rivalry between Saudi Arabia and the UAE on one side and Qatar and Turkey on the other has also spilled into the Horn. As Turkey has made inroads into the region, by fostering close relations with Somalia's government and securing contracts for Turkish firms, Gulf states have tried to push it back. Saudi Arabia and the UAE have also felt compelled to adopt a more muscular posture abroad as American influence in their backyard has waned. Closer relations across the Red Sea can also improve intra-African relationships. As well as helping to negotiate the Ethiopian-Eritrean peace, Gulf countries are trying to ease tensions between Ethiopia and Egypt over a dam the former is building on the Nile. But the weakness of Horn states brings problems. In Somalia, Emirati cash has exacerbated the struggle between the internationally recognised federal government in Mogadishu and the restive, secessionist regions. 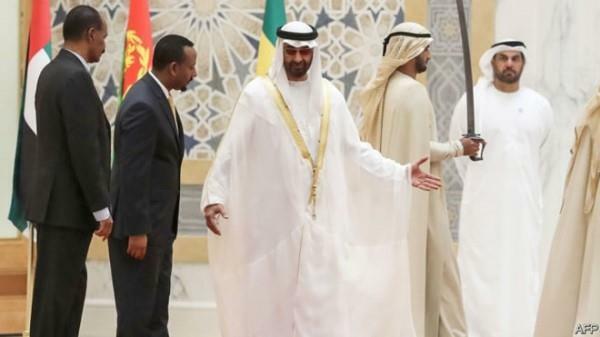 Many Ethiopians fret that Abiy has traded the country's sovereignty for Gulf investment and that, despite trying to remain neutral in Gulf rivalries, Ethiopia now looks as if it is siding with Saudi Arabia and the UAE. Its relations with Turkey and Qatar, on the other hand, may be cooling.